What is Anthroposophy? is a personal work in the sense that it reflects an individual's own endeavors to build a connection to anthroposophy. 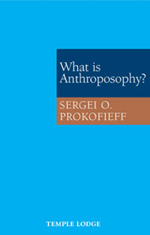 As the author states in his Preface: "...as soon as we comprehend anthroposophy as something living, we are concerned not merely with defining it intellectually but, rather, with developing a real relationship to it..." He elaborates: "The content [of this book] will probably reveal more about the author and his relationship to anthroposophy than about it itself, for its nature is basically beyond description and consequently evades any purely intellectual definition." This is a valuable addition to the introductory literature on anthroposophy from an established and well-respected author. SERGEI O. PROKOFIEFF, born in Moscow in 1954, studied painting and art history at the Moscow School of Art. He encountered anthroposophy in his youth, and soon made the decision to devote his life to it. Since 1982 he has been active as an author and lecturer. In 1991 he became a co-founder of the Anthroposophical Society in Russia, and since Easter 2001 he has been a member of the Executive Council of the General Anthroposophical Society in Dornach. Seventeen of his books are currently published in English translation, including his recent major work May Human Beings Hear It!